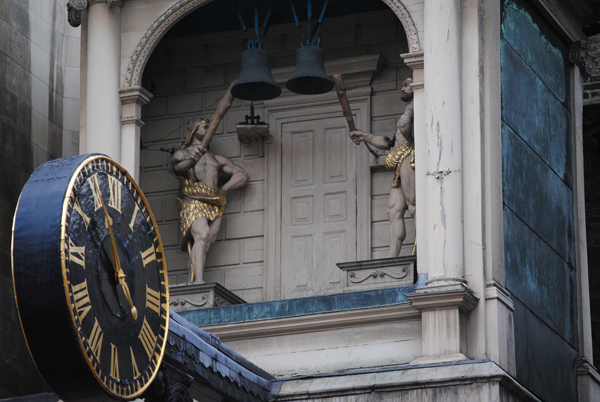 Where’s London’s oldest…public building with electric lighting? The Savoy Theatre, located next to the Savoy Hotel just off the Strand in the West End, was the first public building in London to feature electric lighting. Built to the designs of CJ Phipps and decorated by Collinson and Locke, its construction was instigated and financed by Richard D’Oyly Carte with the specific intention of hosting WS Gilbert and Arthur Sullivan‘s operas. Opening on 10th October, 1881, the first show at the new premises was Gilbert and Sullivan’s Patience, which had been previously playing at the Opera Comique. It continued to solely show Gilbert and Sullivan’s works until 1886 when a falling out led to the end of the partnership between Gilbert and Sullivan. The theatre subsequently hosted comedic operas by other composers as well as productions of Shakespeare (Henry Irving was among those who trod the boards here in the early 20th century). 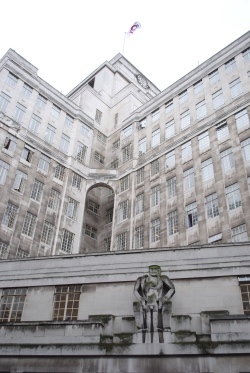 It was rebuilt in just 135 days in 1929 and the new premises featured an exterior designed by Frank Tugwell and interior designed by Art Deco expert Basil Ionides. A fire caused considerable damage in 1990 after which the theatre was again renovated, this time under the guidance of the theatre’s then chairman Sir Hugh Wontner and architect Sir William Whitfield, with the public areas returned to how they had looked under Tugwell and Ionides’ scheme from the 1920s. It reopened in July, 1993, with a Royal Gala performance by the English National Ballet (Diana, Princess of Wales, was among those in attendance). 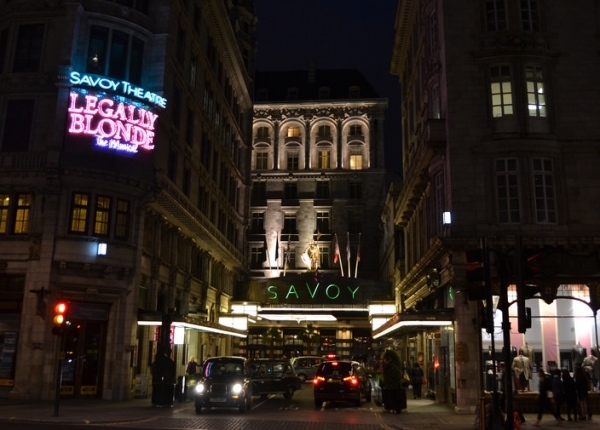 Now owned by the The Ambassador Theatre Group, the Savoy these days it shows a range of different productions. It’s currently hosting Dolly Parton’s 9 to 5: The Musical. For more, see www.thesavoytheatre.com. 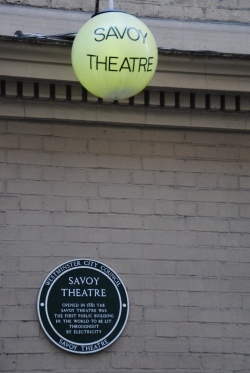 PICTURES: Above – Neon sign for The Savoy Theatre advertising a previous production with the hotel and theatre entrance (Loren Javier/image cropped/licensed under CC BY-ND 2.0); The Savoy Theatre with a Westminster City Council Green Plaque commemorating it being the first public building with electric lighting in London (David Adams). 7. Where’s London’s oldest…umbrella shop? The ‘Fish House’ at ZSL London Zoo in The Regent’s Park opened to the public in May, 1853, and featured large plate glass tanks through which visitors could see life under the water. 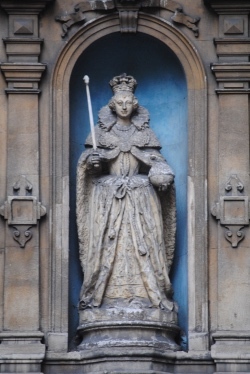 Claimed to be not just London’s but the world’s first aquarium, it owed its origins to the development of techniques which enabled sea life to be kept in a tank, including the realisation that plants could rebalance the water’s make-up by dealing with the carbolic acid produced by fish when they absorbed oxygen from the water. 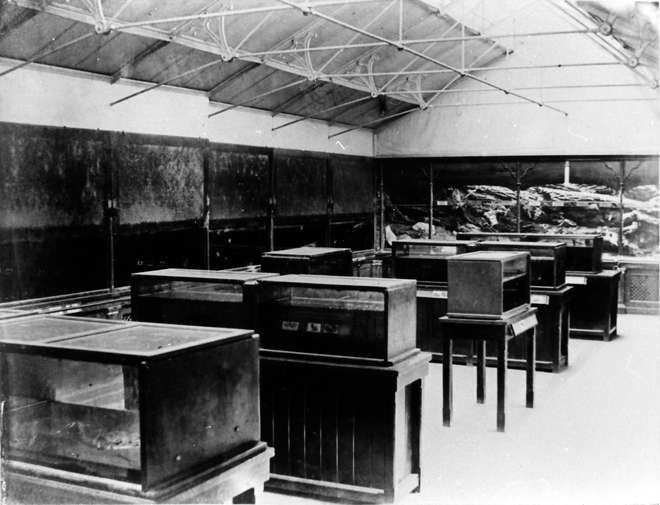 The council of Zoological Society of London had agreed on 18th February, 1852, to build the facility, initially described as an ‘Aquatic Vivarium’ (the original term used to describe a fish tank). But it was soon after it was opened that renowned Victorian marine biologist Philip Henry Gosse first coined the term ‘aquarium’, a truncation of the phrase. Some of the first specimens exhibited in the Fish House – described as “a small collection of the Zoophytes and Annelides” – were actually brought by Gosse from Ilfracombe to London and became the “nucleus” of a collection which, when it was opened, included some 300 marine species. Increasing demand to see underwater life saw the current three-halled Aquarium built on a different site – under the Mappin Terraces – in 1921. It was opened by King George V and his wife Queen Mary in April 1924. Water for the saltwater section was apparently originally taken from the Bay of Biscay and delivered on barges via Regent’s Canal to the zoo. The barges were later replaced with road tankers which brought the water from the North Sea. Species in the Aquarium these days include the tomato clownfish, the red piranha, Banggai cardinal fish, seahorses and the Amazon giant river turtle. WHERE: The Aquarium, ZSL London Zoo, Regent’s Park (nearest Tube stations are Camden Town and Regent’s Park); WHEN: (Zoo entry) 10am to 5.30pm (last entry 4.30pm) everyday until 19th October; COST: Various (check the website for details); WEBSITE: www.zsl.org/zsl-london-zoo/exhibits/aquarium. 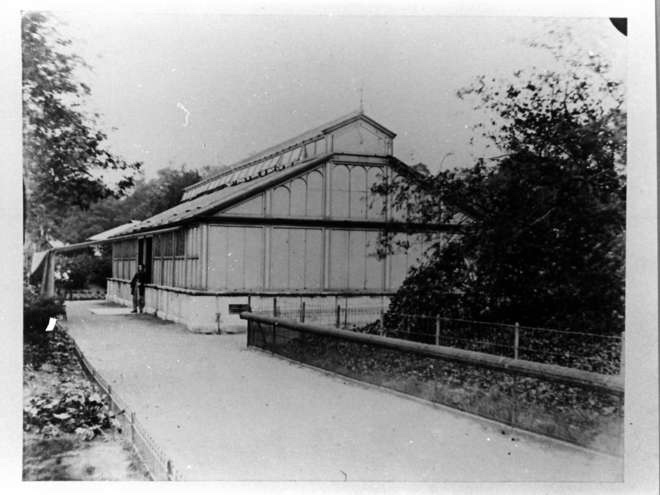 PICTURES: The former Fish House (Courtesy ZSL London Zoo/© ZSL London Zoo). OK, well, they’re not there any more but the first traffic lights erected anywhere in the world were placed on the north-east corner of Parliament Square in Westminster on 9th December, 1868. The location at the intersection of Great George, Parliament and Bridge Streets outside the Houses of Parliament wasn’t chosen by random – there had been several traffic accidents at the congested site. The seven metre tall lights, which were operated by a police constable, were based on railway signals – in fact they had been invented by a railway engineer, John Peake Knight of Nottingham. A City of Westminster plaque commemorates him close to the site. 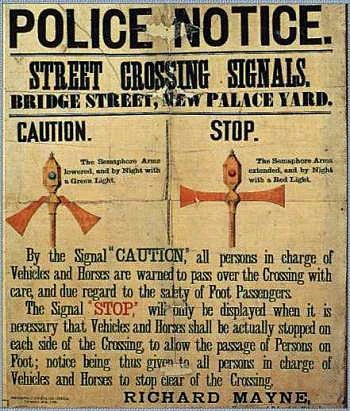 The structure (pictured above in a police notice of which apparently some 10,000 copies were made) featured three semaphore arms which were lowered to an angle (signalling go or caution) or raised to horizontal (signalling stop). There was also gas-powered light for use at night – it changed from green (go or caution) and red (stop). They didn’t last too long – many drivers didn’t recognise what the signals meant, others ignored them and there were frequent problems including a gas leak at the base which led to an explosion injuring the policeman operating them at the time. They were removed the following year. The first electric lights, meanwhile, didn’t arrive in the capital until after their invention in the US where the first were installed in Cleveland, Ohio, in 1914. 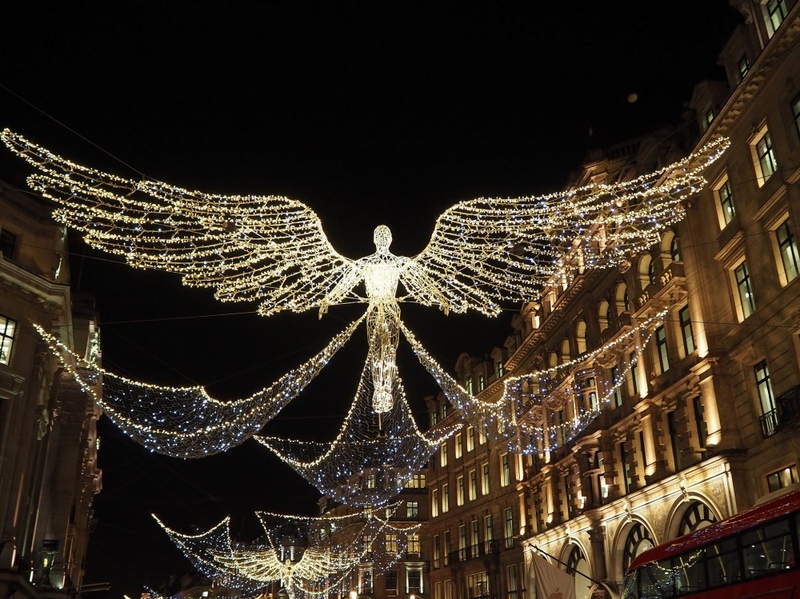 In London it wasn’t until 1926 that the first electric lights were installed, this time at the intersection of Piccadilly and St James’s Street. 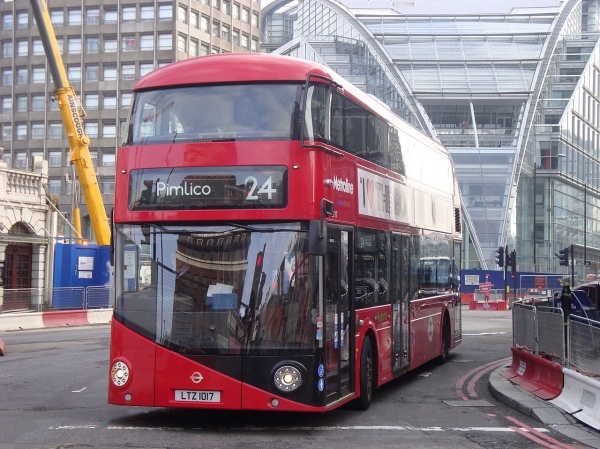 The first vehicle-activated lights came some seven years later and were installed at the corner of Gracechurch Street and Cornhill in the City. 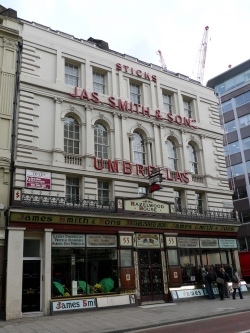 Established back in the early nineteenth century, James Smith & Sons Umbrellas is a West End institution in London and is certainly among the oldest, if not the oldest, surviving business established to sell umbrellas. 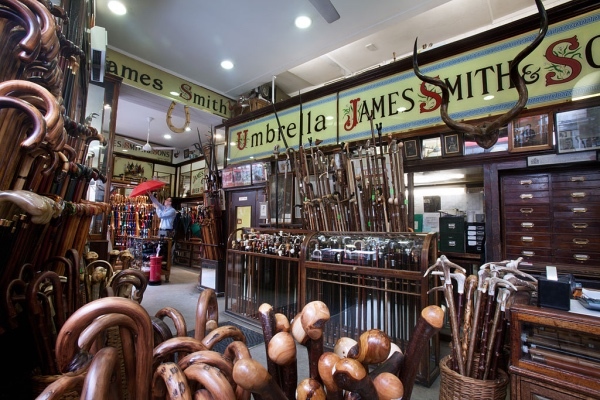 The original shop was founded by James Smith in Foubert’s Place, off Regent Street, in 1830 with the umbrellas made in a rear workshop and then sold at the front. The shop then moved to Saville Place but when this building had to be knocked down to make way for road widening, it moved to Burlington Street near Piccadilly Circus. Business boomed following the invention of Samuel Fox’s lightweight steel frame umbrellas in 1851 and in 1867, a second shop was opened at 53 New Oxford Street (in Hazelwood House, where it remains today). The Burlington Street branch, meanwhile, continued to be operational until it was destroyed by a bomb in World War II, leaving just the shop in New Oxford Street. 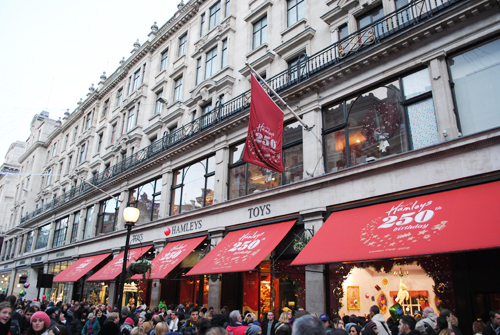 The New Oxford Street shop still sells a plethora of types of umbrellas as well as made-to-measure walking sticks. Some of the umbrellas – which include antique and more contemporary models – are reportedly assembled on site. In the shop you’ll also find a portrait of Jonas Hanway, said to be the first man who owned an umbrella in London. 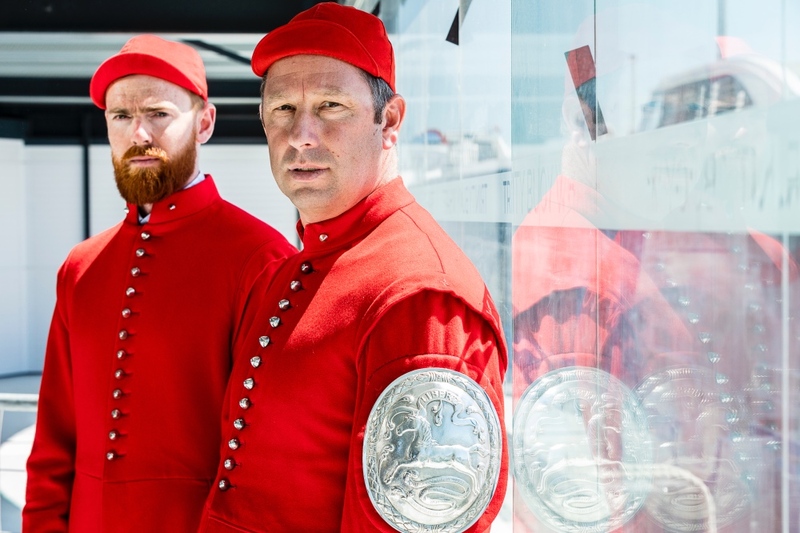 Being an early adopter of this imported fashion trend from France, he apparently attracted the ridicule of London society as well as that of coach drivers who saw the threat to their trade he represented. But history was on Hanway’s side and while the umbrella has survived the past couple of centuries, the coach as a means of transportation has not. Hatters they are, but mad they most definitely are not (more on that connection later). 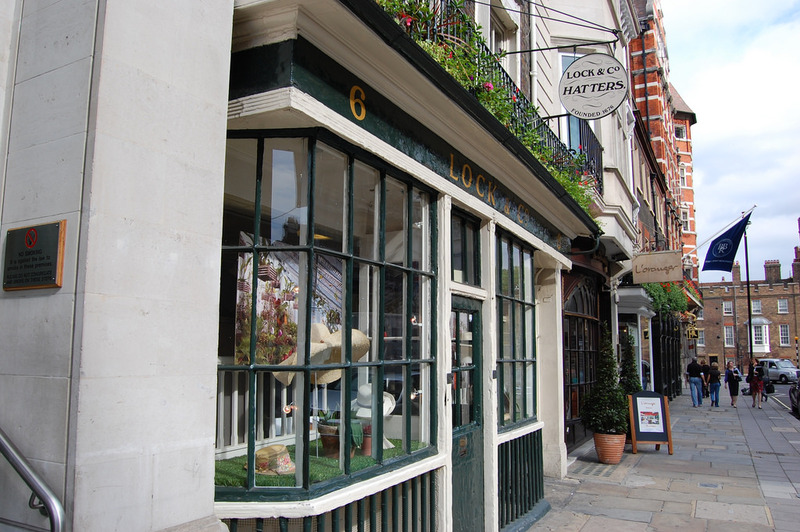 Lock & Co Hatters, which describes itself not only as London’s oldest hat shop but the world’s oldest, has been serving the city’s hat needs since James Lock first opened the doors at number six, St James’s Street, in 1765. 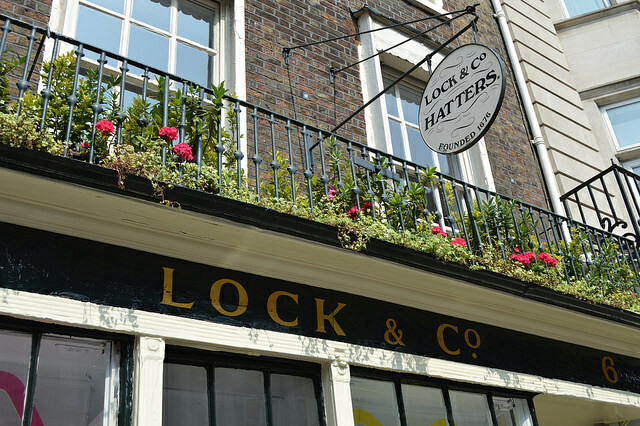 Lock took over the premises after completing an apprenticeship as a hatter with Charles Davis, son of Robert Davis who had opened a hatters in St James’s Street in 1676. Lock had married Charles’ sister Mary in 1759 and, along with his new bride, had inherited his father-in-law’s business. 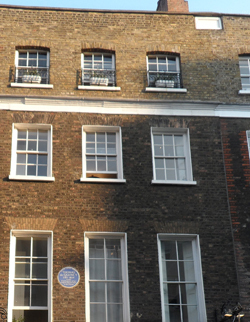 In 1765, they and their growing family moved across the road from that premises to No 6, previously a coffee house. The shop soon established itself with the city’s elite and its client list grew to include the likes of Lord Grenville, Prime Minister between 1806-07, and, most famously, Admiral Lord Nelson, who first visited the shop in 1800 to order his signature bicorne – a “cocked hat and cockade” – with a specially built-in eye shade (Nelson had lost his eye at the Battle of Calvi). Nelson’s final visit, incidentally, would take place in September, 1805, when he settled his bill before setting sailing to Spain where, wearing one of Lock’s hats, he would lose his life – and become part of a legend – in the Battle of Trafalgar. But back to the Locks. James Lock died in 1806 and it was his illegitimate son, George James Lock (aka James Lock II), who inherited the business which continued to flourish (clients around this time include the Georgian dandy Beau Brummell). George’s son, James Lock III and his younger brother George took over in 1821, and in 1849, they were commissioned by Edward Coke to create a hard-domed hat for his gamekeepers – the result was the iconic Coke hat (known to some as the Bowler hat, a name which came from Southwark-based Thomas and William Bowler whom Lock had commissioned to make the hat) . The Lock & Co hat business continued to pass down through the family and the list of the famous who purchased hats in the store continued to grow – Oscar Wilde bought a black fedora there to wear on his US lecture tour (and due to his later incarceration was unable to pay his bill which was settled more than 100 years later by one of his fans after this news was included in an article in The Times) while Sir Winston Churchill wore a Lock silk top hat on his wedding day and also purchased his trademark Cambridge and Homburg hats there. In 1932, film star Douglas Fairbanks, Jr, moved in above the shop (and naturally bought some monogrammed hats which were sold in 2011 as part of his estate) while Charlie Chaplin purchased hats there in the 1950s and, impressively, in 1953, Lock worked with jewellers Garrard and Co to design the “fitments” for Queen Elizabeth II’s coronation crown. A warrant from the Duke of Edinburgh, Prince Philip, followed (in 1993, Lock & Co received its second Royal Warrant, this time from the Prince of Wales. Others among Lock’s more high profile clientele over the years have included Jacqueline Kennedy, wife of US President John F Kennedy, and Lock’s Coke hat even made a famed appearance on the silver screen as the headwear of the Bond villain Oddjob in Goldfinger. 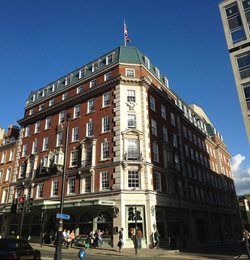 The firm, meanwhile, has continued to grow, acquiring Piccadilly hatters Scott & Co in the 1970s. Lock’s association with Lord Nelson was remembered in 2012 when it designed a hat for his statue atop Nelson’s Column in Trafalgar Square which featured a full-sized Olympic torch and which, due to popular demand, was left on the admiral for the duration of the Olympics. Interestingly, it is also claimed that James Benning, a member of the Lock family and a servant of Charles Lutwidge Dodgson (aka Lewis Carroll) – writer of Alice in Wonderland, was the inspiration behind the ‘Mad Hatter’. PICTURES: Top – Jeremy T. Hetzel; Right – Matt Brown – both licensed under CC BY 2.0. 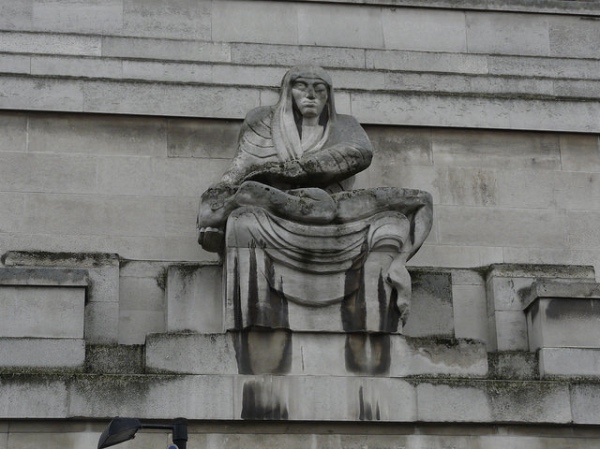 Where’s London’s oldest…public art gallery? The Dulwich Picture Gallery in London’s south celebrates the 200th anniversary of its public opening this year. It is the oldest public picture gallery in all of England. The origins of the gallery back owe their existence to an art dealership run by a Frenchman, Noël Desenfans, and his Swiss friend, painter Sir Francis Bourgeois. In 1790, the men were commissioned by King Stanislaus II Augustus of Poland to form a royal collection of art for him. They spent five years doing so but in 1795, the king was forced to abdicate and the two dealers were left with the collection. They began searching for a new home for it but failed to find one and following Desenfans’ death in 1807, Sir Francis decided to leave the collection to Dulwich College (apparently on the advice of his friend, actor John Philip Kemble). The college had been founded in the early 17th century as the ‘College of God’s Gift’ by Edward Alleyn, actor and theatre entrepreneur, who had left it his estate. Sir Francis died in 1811 and, under the terms of his will, the paintings left to Dulwich had to be made available to the public to view. There was an existing gallery at Dulwich College (the collection had originally been formed around Alleyn’s collection which included portraits or kings and queens) but, conscious that it might not be ideal for displaying the collection, Sir Francis had left £2,000 in his will to refurbish it and made it clear that should this be required, he wanted his friend, Sir John Soane to oversee the work. Sir John, visiting the college the day after Sir Francis’ death, inspects the existing building but decides that an entirely new wing will need to be built to house the collection. He submitted numerous designs but the cost – more than £11,000 – was considerably more than the college could afford despite Sir John’s efforts to cut costs and simplify. Eventually, after Margaret Desenfans agreed to donate £4,000 of her own money, the college officials agreed to begin construction. 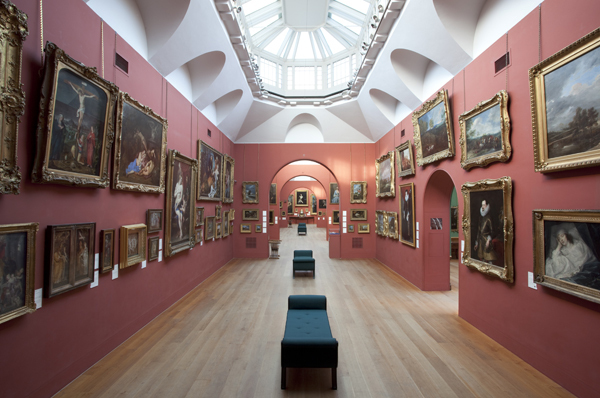 In 1814, the collection was moved into the building and the following year, the now completed building was opened to Royal Academicians and students. The public opening came two years later, in 1817, and the same year the Desenfanses and Francis Bourgeois were buried in the gallery’s mausoleum as its founders. Several additions and renovations have since followed (including works after bombing during World War II). The last major works were carried out in the 1990s after which the gallery was formally reopened on 25th May, 2000, by Queen Elizabeth II. Those who visited the gallery, many as students, have included some big names in the art world – John Constable, JMW Turner and Vincent Van Gogh. Charles Dickens referenced the gallery in his work, The Pickwick Papers, in which he had Samuel Pickwick visit the gallery following his retirement. 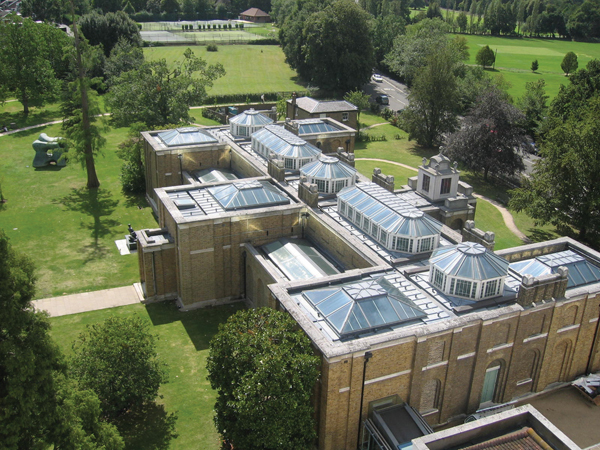 The Dulwich Picture Gallery is now an independent registered charity. Its more than 600 works include one of the finest collections of Old Master paintings in the world by artists such as Rembrandt, Gainsborough, Poussin, Watteau, Canaletto, Rubens, Veronese and Murillo. Collection highlights include Rembrandt’s Girl at a Window (1645), Bartolomé Esteban Murillo’s The Flower Girl (1665-70), Thomas Gainsborough’s Elizabeth and Mary Linley (c 1772) and Sir Peter Lely’s Nymphs by a Fountain (early 1650s). WHERE: Dulwich Picture Gallery, Gallery Road, Dulwich (nearest rail is West Dulwich or North Dulwich); WHEN: 10am to 5pm Tuesday to Sunday; COST: £7 adults/£6 seniors/under 18s free (additional cost for special exhibitions); WEBSITE: www.dulwichpicturegallery.org.uk. 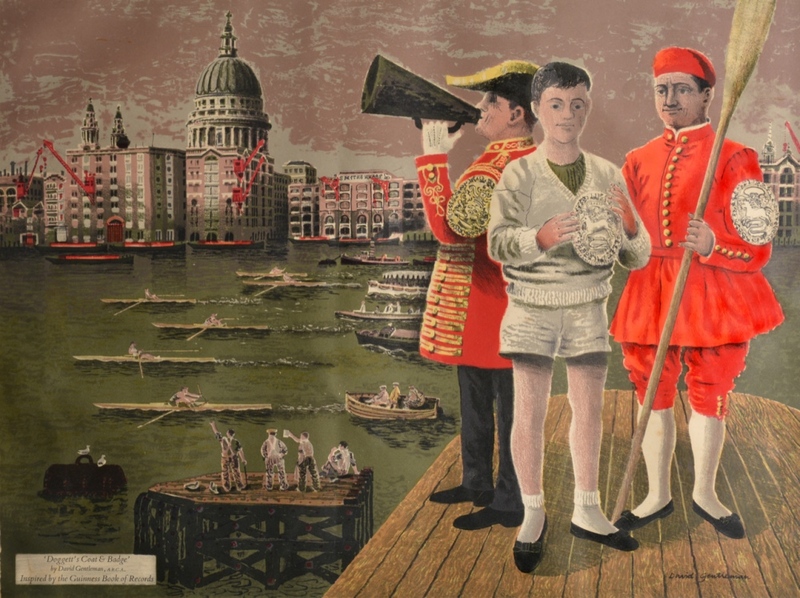 PICTURES: Courtesy Dulwich Picture Gallery. 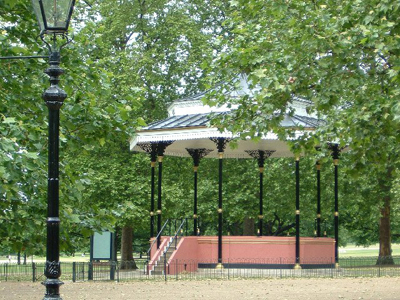 There are several 19th century bandstands in London but we believe the oldest still standing is in Hyde Park. This octagonal, Grade II-listed, bandstand was originally located in the adjoining Kensington Gardens (near Mount Gate), having been built in 1869, only eight years after the first ever bandstand in London had been installed in the nearby Royal Horticultural Gardens in Kensington. It was moved to Hyde Park in 1886 – it can now be found on the north side of Serpentine Road, just to the north-west of Hyde Park Corner – and concerts were apparently held here three times a week in the 1890s. (Another bandstand was erected in Kensington Gardens in the 1930s). Featuring cast iron decorative columns and a tent roof, the Hyde Park bandstand appeared in the 1935 film, Top Hat, which starred Fred Astaire and Ginger Rogers (although the building in the film was actually a replica located on a Hollywood soundstage). Others who have ‘played’ the bandstand include the famous trumpeter Harry Mortimer. The bandstand, which is now one of the oldest in Britain, is still used for concerts on occasion as well as being part of the annual Winter Wonderland event. 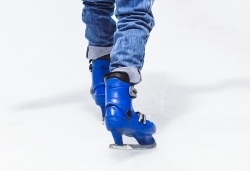 Check The Royal Parks website for details of when events are scheduled here. The oldest extant public toilets in London can be found Wesley’s Chapel in City Road. The gentlemen’s facilities, located off to the side of the chapel, were designed by the famous Thomas Crapper & Co and consist of enclosed wooden-walled cubicles, a series of urinals and wash basins. The well-appointed toilets were installed in 1899 – more than 100 years after John Wesley’s death and long after many other parts of the Georgian and Victorian complex of buildings (including Wesley’s house) were built – but remain in working order even today. Crapper, who had founded his company in the 1860s, championed the concept of the flushing toilet (although the idea had already been invented) and was responsible for the invention of the ballcock system. And contrary to common belief, Crapper – who received several royal warrants for his work – did not lend his name to a slang word for excrement – its origins go back much further.